Club Penguin Cheats by Mimo777 Club Penguin Cheats by Mimo777: No More Club Penguin Buddies? Club Penguin has updated the chat and buddy lists! There is no longer any buddies, we now have friends! Yikes! I sure hope I can keep up! Whoa! Do you like this update? Do you think it will make it easier to find famous penguins? Hmm but that's why. Whenever I click my friends' player card, it shows that they have membership. 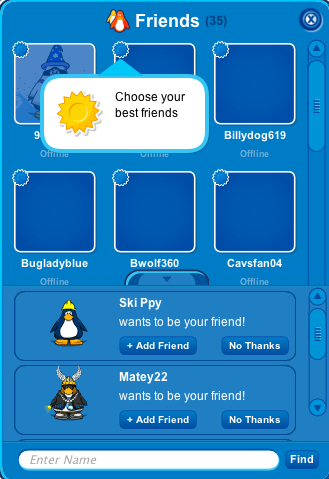 I don't know why but now as soon as I log on, it says I have lots of friend requests. Does it just add everyone in the room? There weren't any there when I logged off last time so it's not built up. I don't want to have to turn down 42 people one by one like last time I went on. yup me too..but not only my buddies, all of the cp hve membership..
but when i ask them they doesnt wnt to answer it..
r my profile also same like them? LOL. 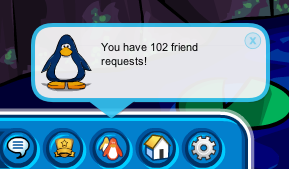 I just logged in and I had 150 requests! 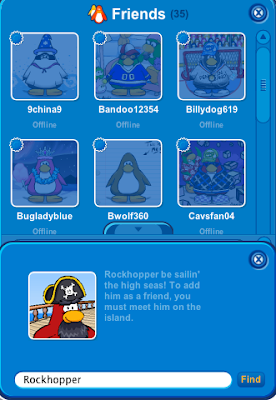 hey mimo, if you play moshi monsters then you should know that club penguin copied the moshi monsters friends system! But is there anyway of finding my long lost friend.. There's this weird glitch where it says that everybody is a member. Does anybody else have this problem? Okay, cool. Don't post my comment I sent yesterday. I can log and it result it as ALL my buddies into friends! Please only put CPD Mod after your name if you are answering a question.